What services does Whiskers n’ Tails provide? Why Should I choose Whiskers n’ Tails? Most animals are much happier being at home in their own environment when their families are away. They get to sleep and play in their usual favorite places, and stay on their normal routine. Most pets typically experience much less stress and anxiety when they get to stay in their home. Whiskers n’ Tails is a professional pet sitting company with over 19 years of experience. We have been caring for cats, dogs, rabbits, fish, birds, hamsters, turtles, frogs, ferrets and more since 1998. We are the proud recipients of numerous consumer service awards. We protect our clients by being bonded and insured. We have a certified Veterinary Technician on staff and are Red Cross Certified in Pet First Aid. 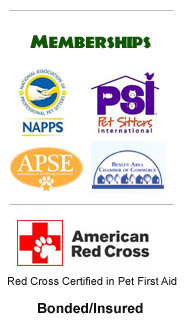 We continue to promote the professionalism of the pet sitting industry thru membership in: Pet Sitters International, National Association of Pet Sitters, Association of Pet Sitting Excellence and the Bexley Chamber of Commerce. Whiskers n’ Tails is an experienced service caring for all types and ages of pets. We have 14 years of experience under our belts and have most likely experienced almost anything that will arise. We know the quickest routes to the 24 hour pet emergency clinics and are familiar with the surrounding veterinary clinics and doctors. We only service the immediate Bexley area so we are always close by in case of an emergency. Our base rate is $20.00 per visit for your first pet. A $2.00 per visit charge is added for each additional pet. A discount is offered for ongoing 5 day/ week dog walking visits. What time do you come to visit my pet? Our pet sitting visits are offered 7 days a week between 6:30am - 9:00pm. We like to stay as close as possible to your pet’s regular routine so the time we arrive at your home is selected by you. We do ask for a 1 ½ hour window that would be appropriate for your pet’s schedule for each visit. We stay for a minimum of 30 minutes each visit, the length of each visit is determined by the type and number of pets in your home. How do I know I can trust Whiskers n’ Tails in my home? We know it can be unsettling to let a stranger into your home and will be glad to answer any questions and address any specific concerns you may have. Whiskers n’ Tails has been caring for pets in Bexley since 1998. We complete over 6,000 pet sitting visits every year and have a proven track record. Since we are a Bexley neighborhood company we are able to offer you many references in your immediate area, sometimes a neighbor. Whiskers n’ Tails is bonded and insured. All of our sitters are comfortable with using home security systems so your home can continued to be protected during your absence. What areas of Columbus do you service? We care for pets in the Bexley, Berwick and Eastmoor neighborhoods of Columbus, Ohio. What if my pet becomes ill while I am gone? We collect a health history of your pet during our interview as well as your regular veterinarian contact information. We monitor your pet’s health, eating, water intake, bowel movements, energy and overall appearance every visit. Anything unusual is noted and we will contact you and your veterinarian with any concerns. In case of a medical emergency we will transport your pet to either their regular veterinarian or if after hours to Med Vet or OSU Veterinary Hospital for immediate care. We are trained in Pet First Aid and carry the Pet Poison Hot Line number with us to all visits. Are there any additional charges besides the base rate? Usually there are no other charges associated with our services, there are no hidden charges of any kind. We do have a $10.00 per day holiday charge for the major holidays of: Easter, Memorial Day, Fourth of July, Labor Day, Thanksgiving, Christmas Eve, Christmas Day and New Years eve and New Years Day. There is an additional charge if we have to bring your pet to the vet for medical treatment or if we have to go to the store to buy pet supplies that you ran out of during your trip. Any extra time spent outside of your scheduled pet sitting visit is billed at $40 per hour plus .60 per mile driven. Does Whiskers n’ Tails ever decline caring for a pet? All of our reservations are accepted based on availability. The earlier your reserve your pet sitting visits for your travel dates the better. We accept reservations up to a year in advance. We do have a few set policies which we enforce for the protection of your pets and home. We are unable to break these policies. We are unable to care for a pet that is aggressive towards us or one that is so scared of us that we are unable to properly care for it. We are unable to care for outside cats or dogs. This includes dog doors and or dogs staying in a fenced yard when we are not at your home. We must visit your home at least once a day for cats. We do not offer every other day service. We ask to be the only care providers for your pets, unless it is another resident of your home. We will be glad to discuss and explain any of our policies. Please contact us at 614-354-5508 for any policy concerns.